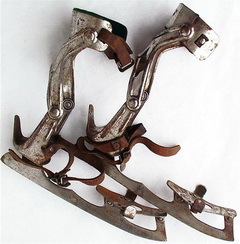 In early times, when ice skates did not comprise much more than an iron strip fixed to a piece of wood, many people had difficulty with standing firmly. Mainly due to ice cutting slag between boot soles and platforms. 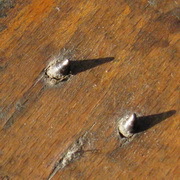 As to improve the grip skate makers tended to knock some nails into the platforms and cut the heads off (see detail 1) or to file tips to the heel nut (see detail 2). 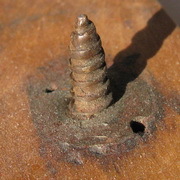 English skate makers introduced heel screws that were screwed into the boot heels (see detail 3). Another phenomenon are weak ankles. Numerous starting skaters suffer of them and as a result many of them never master to learn the art of skating. 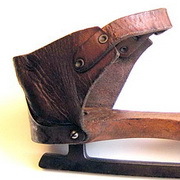 Nowadays most ice skates have fixed boots but until then skate makers had to invent aids to meet the problem as for instance leather heel pieces that were screwed to the platforms to keep the heel in p lace (see detail 4). In the USA ice skate makers went further and designed ankle supports as shown alongside. They consist of metal heel pieces with hinged upstanding consoles that could be fastened around the ankle by means of a kind of brace. Thus the ankle could bend forwards and backwards a little but no longer sidewards. The many repairs at antique ice skates show that the athwart forces can be immensely. Of this type of ice skates a peculiar model exists that is very much sought in circles of collectors, viz. Blondin skates. The figure underneath makes clear that they are basically club skates. The bindings, however, make them extravagantly. The heel and ankle supports have been made from brass plate. 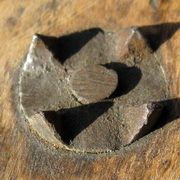 The lower parts are fixed to the platforms with screws (see detail 5). The upper part is hinged to the lower part and may bend for- and backwards. Together with the leather straps the ice skates can be bound to the boots thoroughly. With a little bit of fantasy this kind of ice skates may be seen as forerunners of the present scale boots. These ice skates thank their name to a French circus artist named Emile Gravelet (1824-1898) but better known as Blondin the rope-walker. He was born in a famous circus family and learned walking the rope as a child. He showed his ability for over 60 years. One of his greatest tricks existed in crossing the 400 meters wide Niagara Falls in 1859 on a slack cord. 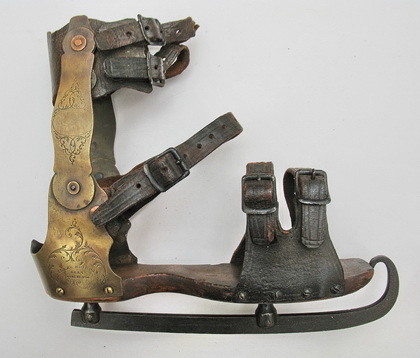 It is not known whether he did tricks with ice skates as well, but it can be very well have been the case as the inscription in the heel support mentions a patent that was granted him on October 2, 1860 (see detail 5 and 6).